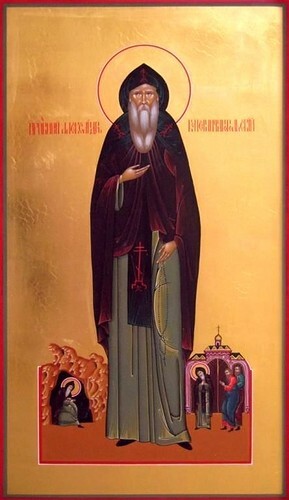 Venerable Alexander, founder of the Monastery of the Unsleeping Ones, was born in Asia and received his education at Constantinople. He spent some time in military service but, sensing a call to other service after reading the passage in Holy Scripture that says: "If you seek perfection, go, sell your possessions and give to the poor. You will then have treasure in heaven. Afterward come back and follow me" (Matt. 19:21), he distributed all his belongings to those in need and left the world, accepting monastic tonsure in one of the Syrian wilderness monasteries near Antioch, under the guidance of the elder Elias. He spent four years in strict obedience and monastic effort, after which he received from the abbot the blessing to dwell in the desert. Going into the wilderness, the monk took with him nothing from the monastery, except the Gospel. The monk then struggled in the desert for seven years. Afterwards, the Lord summoned him to preach to pagans. The Saint converted to Christ the local city ruler named Rabul, who afterwards was consecrated a bishop and for thirty years occupied the bishop’s throne of the city of Edessa. Together with Rabul all the local inhabitants accepted Baptism, and before receiving the mystery they burned their idols in the city square. Having confirmed the newly-converted in the faith of Christ, Alexander again went into the desert, where by chance he came upon a cave of robbers. Unafraid of the danger that threatened him, he preached the gospel to them and urged them to repent. In fact, all the robbers did repent. They accepted holy Baptism, and they transformed their cave into a monastery, where they dwelt in prayer and repentance. Alexander appointed an abbot for them, gave them a monastic rule, and he himself resettled still farther in the desert. For several years he lived in complete solitude along the Euphrates. But even there lovers of solitude began to flock to the monk. A monastery emerged, numbering 400 monks. Desiring at this monastery to establish uninterrupted praise to the Lord, the monk prayed for three years, that the Creator would reveal to him His will, and having then received the revelation, he initiated at the monastery the following order: all the monks were divided into 24 watches of prayer. Changing shifts each hour, day and night they sang in two choirs the Psalms of David, interrupting this only for the times of the divine services and liturgies. The monastery received the name "the Unsleeping Ones” (Akoimeton), because the monks sang praise to God throughout the day and night. 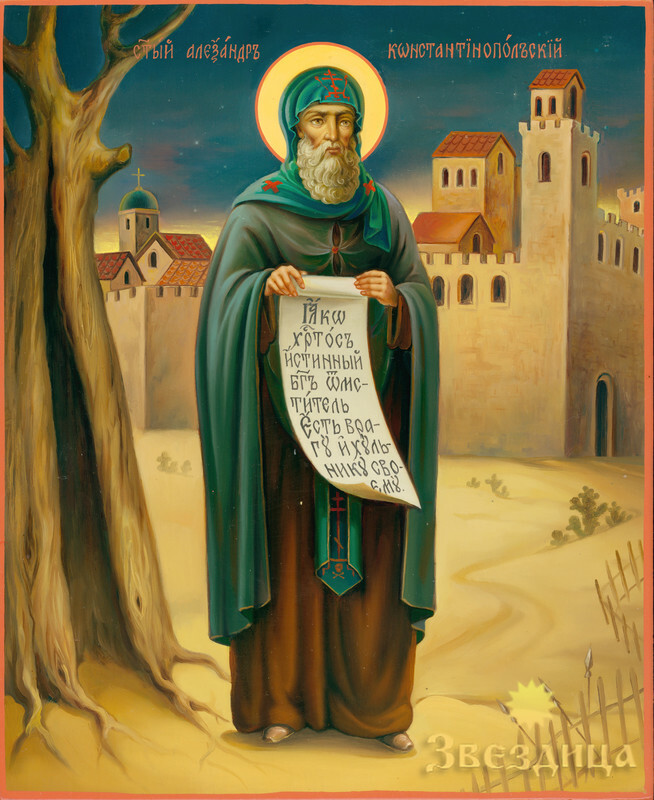 Saint Alexander guided the monastery on the Euphrates for twelve years. Afterwards, leaving one of his disciples, the experienced Elder Trophimos as its abbot, he set out with some chosen brethren through the cities bordering on Persia, preaching the gospel among the pagans. After this missionary journeying, Alexander lived with his monks for a certain while at Antioch. There he built a church for the city-dwellers, and a home for the sick and homeless with the money that charitable Antiochians put at his disposal. However, through the intrigues of the jealous, Alexander was compelled to move to Constantinople. Here he founded a new monastery, in which he also initiated a monastic rule of unceasing vigilance. Alexander and his monks suffered at Constantinople under the Nestorian heretics, enduring beatings and imprisonment. After this, when the storm of unrest abated, Saint Alexander spent the last days of his life at the Constantinople monastery he founded, which became known as Akoimeton. He died in extreme old age in about the year 430, after fifty years of incessant monastic effort. It should be noted that Venerable Alexander does not have an official feast day. On December 29th his successor Saint Markellos is commemorated, where Alexander is commemorated through him, but a separate feast day for the Saint has been established in recent years for January 15th in the Greek Churches. In the Slavic Churches he has two feast days - February 23 and July 3. Concerning this holy monastery, the story is still related. Farther from us, farther from them, the furious ones let them hide. And all the virgins for the sake of Christ and all the hermits. And sleeplessly magnify the wisdom of God.